I’ve heard a lot of talk over the last couple of years about the sales funnel being dead. What a load of nonsense. It’s not that long ago these sorts were telling us SEO is dead or – more recently – that web design is dead. 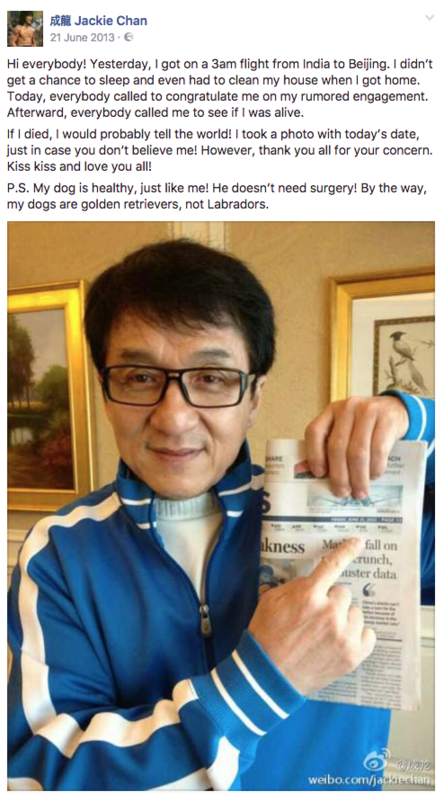 Jackie Chan has also died multiple times over the last couple of years but I have my doubts about this, too, unless he has at least one identical twin who also happens to be versed in multiple forms of martial arts. Okay, so death rumours aside, the sales funnel is in good health and every argument I’ve heard suggest otherwise comes from someone trying to create a selling point for one of their products. What has changed in recent years is how marketers use the sales funnel because the number of interactions between brands and consumers along the buying cycle has multiplied. More importantly, though, we can use these interactions to capture prospects at various different stages of the consumer journey, prioritise which of those are most important and guide them closer to conversions. Here are five strategies to do just that. The basic sales funnel principle still applies as much now as it did five years ago. Don’t let people try to make it sound more complex than it is. Yes, there are considerably more interaction points – both online and offline – between brands and consumers, but the stages buyers go through are essentially the same. These are the key stages that matter most. You can call them what you like, but every successful consumer journey goes through the first three of these stages. As for the other two, you want every possible customer to reach these stages of the buying cycle. Awareness: The moment a user first discovers your brand, product, offer, ect. Consideration: They’re interested but not ready to buy now – perhaps comparing you against the competition or waiting for a special offer. Conversion: When a user finally makes the choice to buy (hopefully with you). Loyalty: Users who regularly buy from you and find it difficult to go elsewhere. Advocacy: Users who actively recommend you to potential buyers. The key thing here is that your marketing funnel doesn’t end with the purchase. There is plenty more work to be done at this stage. You can add as many stages into this funnel as you deem necessary to your brand but, again, it’s up to you how complex your marketing funnel should be. You can also expand it with time as your strategy becomes more efficient and new opportunities arise. First, though, you want to map out all the potential interactions users can have with your brand and assign them to the most relevant stage of our marketing funnel. For example, a first-time visitor on your site will fit into the “awareness” category while someone who has repeatedly visited the same product page probably fits in the “consideration” stage. By mapping out these interactions and assigning them to each stage of your marketing funnel, you can then target each user – based on their previous actions – with marketing messages designed to move them closer to the purchase. For now, though, let’s crack on with our strategies. This is basic marketing logic. The best lead you can have (at least, in theory) is the one closest to buying right now. Aside from them being the most likely kind of lead to convert, it’ll take much less work on your part to make it happen. When you’re talking about high-quality leads, these are the gold standard: highest potential; minimal input. You want as many of these as possible. So the obvious approach to funnel marketing is to focus on high-intent users who show all the behaviour of someone ready to buy. And your best weapon for this is AdWords – the only platform that allows you to target people itching to buy. 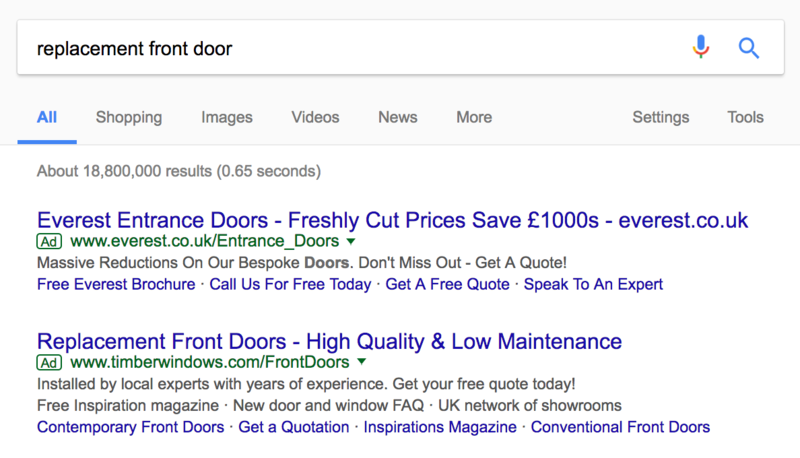 People turn to Google when they’re about to jump from consideration to conversion and AdWords is the only channel that allows you to target high-intent search queries that have “next customer” written all over them. Going straight for the likeliest buyers is a great way to start your marketing funnel strategy, but you’ll never maximise conversions if that’s your only approach. High-intent leads may be the most valuable but they’re also the least common and competition for them can be fierce. Going back to the AWeber funnel graphic, you’ll see each stage of the buying process contains a smaller number of potential leads. But what happens if you turn your attention to all those consideration leads and convincing them to convert? This is precisely what you’re going to do. And because you’ve already assigned user actions to each stage of your marketing funnel, you know what kind of behaviour people in the consideration stage will demonstrate. Searches for product, service, company reviews. Best of searches: best product type, best businesses in an industry, etc. Like I say, there will be an entire list of interactions for each stage you create in your marketing funnel. The point is, you can use these interactions to target leads at each stage and then create marketing messages to bring them closer to the sale. The largest pool of leads is always the least qualified, but every one of them is still a potential customer – one that might shop with one of your competitors if you don’t get them first. So, to maximise your marketing funnel conversions and keep your rivals in check, you also want to guide as many of these potential buyers towards the finishing line as possible. To capture these leads, you’ll be using a mix of organic search, social advertising and AdWords to target prospects who have reason to be interested in your brand. These leads won’t necessarily have any intention of buying right now but they hold good potential for the future. Facebook is particularly good at capturing these leads, thanks to its targeting options. You can narrow down on users based on their demographic info, interests, online behaviour and previous purchases. AdWords also has a role to play here, letting you target lower-intent searches like “how often should I audit my website?” and getting these users involved with your brand. Targeting these leads is the easy part; guiding them along the buying process is more challenging. For this, you’ll need an effective content strategy that provides them with the information they need and keeps them coming back for more. You’ll want to get these people signing up to your newsletter – or some other kind of email interaction – as soon as possible. This gives you a channel to segregate audiences and target them with more relevant messages that move them along the sales funnel. This also touches on other important factors, like website optimisation, maximising web form conversions and call to action design – things you’ll need to work on as you refine your marketing funnel strategy. I mentioned earlier that the sales funnel goes beyond the first purchase. You don’t want customers to buy once and then forget about you. You want them to buy again and become long-term customers who are loyal to your brand. You want them to recommend you to other people – both online and offline – who might also be interested in what you have to offer. This is where your loyalty and advocacy strategies come into play. The most important part of this comes down to the quality of your product/service and your customer care system. Essentially, the entire experience of dealing with your brand matters when you want people to continue opening their wallets and recommend others start doing this same. By this stage, you already have your customers’ details and every reason to reach out to them. All you need now is to think beyond the purchase and create the best possible experience while building a gradual incentive to buy again, making them know it’ll be hard to get a better deal elsewhere. 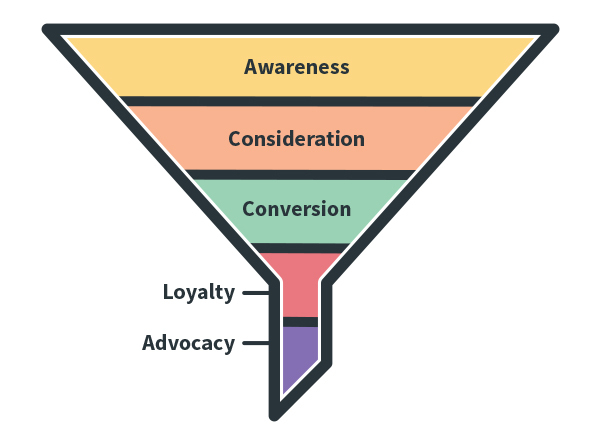 Now we’ve covered the key stages of the marketing funnel, it’s time to bring it all together. You don’t want to be manually picking up leads at each stage of the buying process and then craft marketing campaigns for each of them. To maximise your marketing funnel conversions, you’ll need to automate as much of this process as possible. To do this, go back to your list of interactions, which are all assigned to the most relevant stage of the buying process. What you need now is a system capable of detecting these interactions and then assigning them to segmentation lists. This will allow you to target users on each list with campaigns relevant to their place along the buying journey. The good news is you can do this in Google Analytics for the majority of actions that take place on your website. With a combination of events tracking and segments, there aren’t many actions that can’t be assigned to a segmented list in Analytics and then imported to any other marketing platform you use. Export these lists to your sales automation software and you’ve got a free reign to target users with personalised marketing messages as they work their way along the consumer journey. You can also link up AdWords to Google Analytics to create RSLA lists, allowing you to target users with different display ads as their needs change. Once again, you create lists based on your interactions and they’ll be updated automatically as soon as a user takes any action to suggest they’ve moved onto another stage of your marketing funnel. Your other key weapon in funnel automation is email marketing. 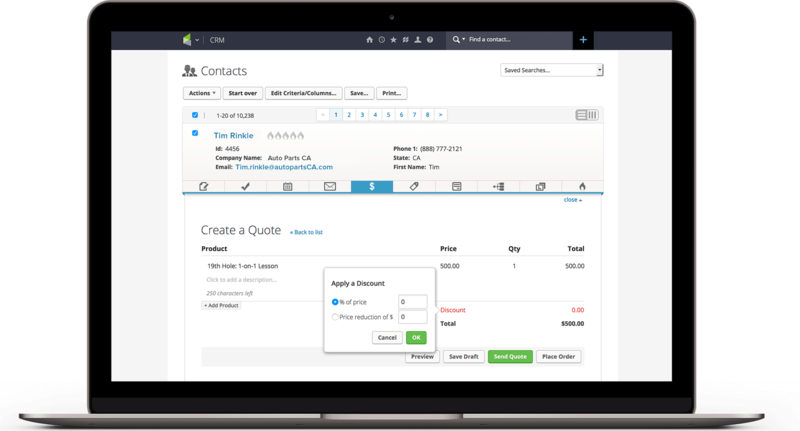 By automating with ActiveCampaign, SendinBlue or whatever email software you’re already using, you can reach consumers at every stage of the buying process and make your messages as personal as you feel necessary. The sales funnel we looked at from AWeber before may be a simplified version of what most brands are looking at these days, but the same principles apply. 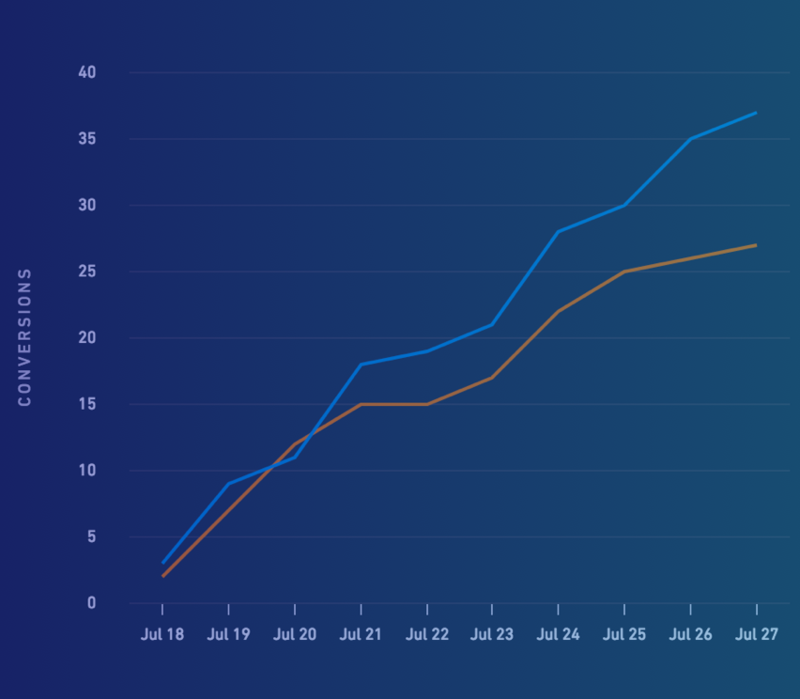 The only thing that’s really changed over the years is that we now need to pick up leads at every stage of the funnel in order to maximise conversions. We now put more focus on lead nurturing and optimising each stage of the consumer experience to prevent leads slipping away and buying elsewhere.